What if a bridge can be built higher than the Eiffel Tower? Well, soon this will become a reality once this arch-shaped steel bridge gets completed over the Himalayas in 2016. The bridge, being built over the Chenab River, will beat a railway bridge located in China that holds the recognition of being the world's highest bridge. The amazing bridge is expected to be 359 meters high, more than 80 meters higher than the actual record holder. The Indian structure will have a length of 1,315 meters and will have over 25,000 tons of structural steel. It is important to highlight that in India there are no building code provisions for such a massive structure. The bridge will be built using a two-ribbed steel arch flanked by concrete lanes. The chords of the trusses are steel boxes filled with concrete. The concrete used in the steel boxes will be used to control wind induced forces on the bridge. The bridge is being erected using two cable cranes, the largest in the world. The design incorporates seismic provisions and is design to withstand winds up to 260 kilometers per hour. Structural design was completed in order to prevent damages by terrorist attacks. To enhance safety and security, the bridge will be made of 63 millimeter-thick special blast-proof steel. The bridge is being constructed on a transition curve, having both horizontal and vertical curves. The project started construction in 2002 and stopped in 2008. Construction has resumed two years ago and shall be completed by 2016. The world's highest bridge will reduce travel time between Baramulla and Jammu in half the time it actually takes, six hours. The massive structure is expected to have a lifespan of 120 years. Design and construction of the bridge were ​awarded to a joint venture of Afcons Infrastructure, Ultra Construction & Engineering Company of South Korea and VSL India. The construction methodology used will minimize the number of bearings required, reducing the maintenance requirements. 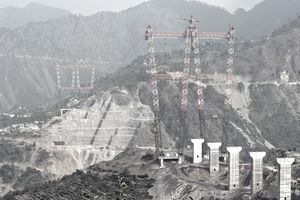 The 'sky-bridge', as it is often called, is being constructed on the Chenab River upstream of the Salai dam between the villages of Bakkal and Kari. At present, the world's tallest rail bridge is on France's Tarn River, with its tallest pillar rising 340 meters. The design of the 1.3-km-long bridge is divided into three segments: a 467-meter steel arch in the center, a 185-meter approach deck from the Bakkal ​end, and a 650-meter approach deck from the Kauri end. The paint being used in the bridge is manufactured in Japan and is expected to last at least 35 years. Normally the paint used in this type of bridges will last only five years. An anemometer has been installed at the world's highest bridge site which will measure wind speed at the bridge site and will interlock train movement over the bridge automatically if there is any wind above the prescribed speed.